05 March 2019 - United Arab Emirates: Continuing its march into the manufacture of mid-engined hypercars, Aston Martin is proud to present the design concept for AM-RB 003 at the 2019 Geneva Motor Show. The British marque can also confirm that AM-RB 003 - previously known as Project 003 - will benefit from the close involvement of Red Bull Advanced Technologies in its design and engineering, continuing one of the brightest and most exciting engineering partnerships in the automotive world. 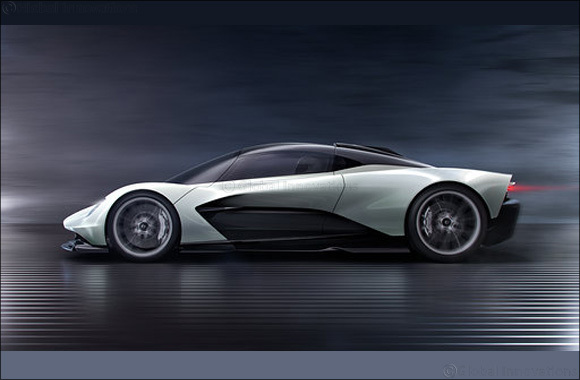 As its codename suggests, the AM-RB 003 follows the Aston Martin Valkyrie and Valkyrie AMR Pro as the third hypercar in Aston Martin's mid-engined story. Both evolutionary and revolutionary, AM-RB 003 will incorporate concepts and technologies taken directly from F1TM and applied to the epoch-making Aston Martin Valkyrie, providing it with performance to meet and surpass the performance demands of existing top-end hypercar rivals. F1 TM technology into a car built in larger numbers - but still strictly limited to 500 coupes worldwide – and making a design statement that's second to none. According to Miles Nurnberger, Aston Martin Director of Design, while AM-RB 003 is heavily influenced by Aston Martin Valkyrie, it is very much its own car: “We were quite deliberate in AM-RB 003 to not disguise its lineage, but we were equally emphatic that it would be a distillation of Aston Martin Valkyrie and not a dilution. Sharing the same fundamental styling and aerodynamic philosophy with Aston Martin Valkyrie, the AM-RB 003 features a pronounced front keel and large rear diffuser, with the underfloor generating the bulk of the downforce. However, AM-RB 003 will also benefit from next-generation aircraft morphing technology, to create a variable airfoil across the entirety of the rear wing. The technology named FlexFoilTM – developed by FlexSys Inc. – has been validated by NASA through extensive performance and acoustic flight testing, with Aston Martin the first to implement this cutting-edge aerospace technology in the automotive industry. The system allows for the car's downforce to be changed without changing the physical angle of the entire element, resulting in a seamless design with high performance, improved efficiency and reduced wind noise. Turbulence and the associated drag increase found in current “state of the art” active wing designs is virtually eliminated too. The production design will allow for even larger leading and trailing edge deflections than shown in today's concept and will incorporate greatly increased actuation rates to allow a real-time response to changes in the vehicle's dynamic state. Across the top surfaces, other aerodynamic demands create a similar shape to Aston Martin Valkyrie, but new lamp shapes at the front and rear ensure it has its own identity. The lamp graphics are unique, but the internals are taken directly from Aston Martin Valkyrie due to their lightness, with the combined weight of all four units totalling less than the weight of one DB11 headlamp. One of the biggest differences between Aston Martin Valkyrie and AM-RB 003 is the size of the cockpit, for it was part of the latter's design brief that it should make greater concessions to usability and comfort. To this end, the AM-RB 003 has LMP1-style doors, which open forwards taking a section of roof with them to facilitate easier ingress and egress. To create more space between driver and passenger the centre console has been widened, while luggage space is provided via a terrace behind the seats. There will also be stowage areas for oddments such as a wallet or mobile phone. The cockpit itself showcases a bold new design and material philosophy aimed at achieving a reduction in visual clutter and the creation of a uniquely stimulating, dynamic and focussed driving environment. Called ‘Apex Ergonomics‘, it relies on the perfect alignment between the centreline of the driver's back, steering wheel and pedals and the careful positioning of other elements throughout the cabin to support this driver focussed experience. A display screen mounted on the steering column allows for the best possible view through the steering wheel without any rim block, while the Infotainment systems ultilise ‘bring-your-own‘ technology - delivered via a Smartphone - for maximum efficiency, functionality, simplicity and flexibility. Another visual expression of ‘Apex Ergonomics' can be found in the wraparound band that provides a distinct and functional divide between the lower section of the cockpit and the upper section defined by the extreme curvature of the windscreen. Featuring recessed vertical gills, this band provides discreet delivery of audio, ventilation and ambient lighting and creates a bold, yet fully integrated technical feature as opposed to the traditional placement of individual air vents and speakers. It serves to focus and emphasise the driver's attention to this horizontal widescreen zone, which in turn is the area in which all the main controls, displays and material touch points are concentrated. Where traditionally these materials would be wood, leather or glass, the AM-RB 003 signals a transition to advanced design and manufacturing techniques that pioneer what we describe as Space-Craft; that's to say space-age technology and traditional craft. Now the authenticity is in lightweight properties and the application of advanced design and manufacturing techniques, including the use of state-of-the-art 3D printing methods; a shift driven by the need to save weight in every area of the car. For example, the 3D printed centre console is a part that removes 50 per cent of the mass, while having integrated functional switches. In addition, thanks to CAD modelling it's possible to create parametric forms that look very fine, intricate, and in places ‘impossible' to make. This fuses the purity of obsessive attention, to weight saving and exceptional visual and tactile qualities. Full technical details of the AM-RB 003 will be revealed as the development programme progresses, but it will be the first car to receive Aston Martin's new hybrid turbo V6 engine, marking Aston Martin's return to in-house designed engines. Hours campaigns to prove out its performance and durability credentials. Its use on the Aston Martin AM-RB 003 will the first for a road-going car worldwide. AM-RB 003 will deliver outstanding levels of downforce in a road-legal car package. The technology transfer continues with active suspension and electronic systems that share a common philosophy with Aston Martin Valkyrie, delivering a chassis blessed with next-level precision, control and driver connection. Working closely with RBAT, the responsibility for creating the optimum dynamic set-up for AM-RB 003 falls to Aston Martin Chief Engineer, Matt Becker and Aston Martin Expert High Performance Test Driver, Chris Goodwin. Currently immersed in the ongoing development of the Aston Martin Valkyrie - initially using RBAT's world-leading simulator before the first running prototypes are completed - Becker and Goodwin's renowned feel and unrivalled expertise will ensure continuity between both Aston Martin Valkyrie and AM-RB 003 projects, providing the Advanced Operations team, led by Chief Engineer Fraser Dunn, with invaluable information to create a car with its own unique character and dynamic fingerprint. Andy Palmer, Aston Martin Lagonda President & Group CEO, said: “When Aston Martin secured the services of Red Bull Advanced Technologies to embark on the extraordinary journey that became Aston Martin Valkyrie and Aston Martin Valkyrie AMR Pro, it was always my hope that it would lead to a long-term collaboration. As these projects enter an incredibly exciting phase with the commissioning of the first running development prototypes, it gives me tremendous satisfaction to confirm that this exceptional partnership is continuing with the AM-RB 003 - a hypercar that not only draws from the ethos and DNA of Aston Martin Valkyrie, but will in turn influence Aston Martin's first series production mid-engined supercar”.